Click to get the frames link column This is a the selection of some of the best bridge card game CD-ROMs around. Most are for sale over the internet at the Amazon.com store. Click the links for previews of this DVD on clip1 and clip2 on youtube. This new (October 18, 2011) version 22 has new Bridge Tournaments for free, such as the 2011 Cavendish (with Butler cross-IMPs scoring) and the 2011 NSWBA ANC Butler Open Section (with Butler IMPs Scoring). Also added are 24 new challenging problem deals for a total of 326 Challenges. Kit woolsey, multiple world champion and author of several bridge books, designed the new deals. You can now see what Bridge Baron is “thinking” about, at higher levels of bidding and play. The option to choose among hand evaluation methods, such as long-suit point count or short-suit point count. Bridge Baron offers you the most comprehensive, easy-to-use, bridge game available. Bridge Baron 18 Express Edition has over 40 skills levels, plays 500 deals, over 95 optional bidding conventions and many other features. Compete in tournaments deals. Hints are always available (including reasons why). Double dummy solver. Par contract analysis. Choose long-suit or short suit point count. Conventional bids alerted or announced. With all these features, it's no wonder that Bridge Baron is five-time winner of the world computer bridge championships. In order to get the most out of your Bridge Baron, order the book Bridge Baron Companion - How to Get the Most Out of Your Computer Bridge Game, which is reviewed in bridge books reviewed page 15. Bridge Buff 19 and Bridge Deal 7 is two programs on one CD. Bridge Buff plays a great game of bridge and is highly praised throughout the Bridge Community. It is perfect for all levels of players, with tutorials for beginners and intermediates, and large numbers of conventions (codified deep into the auction), for more advanced players. Note that the Amazon box says Bridge Buff #17, it is actually #18. Visual Deal is a versatile deal generator with an integrated double dummy analyser. You can design hands in many ways such as hands suitable for a specific convention or hand pattern. Bridge Buff features excellent auction stability and uses Visual Deal to deal out thousands of randomly generated deals, complete with auctions. Each auction is then tested for reasonableness. There is a matchpoint-style bidding mode featuring aggressive bidding sequences around the table, similar to action found in your local duplicate club. There are two playing modes. In Practice mode, you have full control over every element of the game, and you can redeal, rebid, replay, take back cards, peek, and cheat as much as you want. In Match mode, you play a series of hands against a 'closed room' opponent and can play Teams, Pairs and Individual matches. Match mode also includes matchpoint estimates so you can measure how well you are doing against both strong and weak fields. The Bridge Buff displaylooks terrific and is exceptionally easy to use. It features one-button access to most functions, and includes balloon help comments over most buttons. Bridge Buff features a huge range of optional modern conventions. Apart from all of the above, there is one very important feature for serious players that sets Bridge Buff apart from all of the other bridge playing programs. The program supports three basic bidding systems, Standard American, 2/1, and Kaplan-Sheinwold; but the 'System Builder' which enables you to define a system or convention a bid at a time. For example, if you want to play Precision Club, you can specify that any hand with 16+ high card points be opened 1C, and that after the sequence "1C-P", partner should bid 1H with 5 Hearts and 8+ HCPs, and so on. This is the only Bridge playing program which offers this capability. Bridge Baron and GIB do not support Precision at all. Q-Plus does support Precision, but there is not one standard version of Precision, so it is unlikely that Q-Plus plays the specific variation that you play, and there is no way to modify it to make it do so, as you can with Bridge Buff. Also, when Bridge Buff makes a bidding error, you can go into System Builder and make an entry to correct it. Then when the same situation arises in the future, Bridge Buff will bid the way you want it to. Even if you never create a system of your own, it is worth learning to use builder to fix these kinds of errors. Visual Deal is a hugely flexible Deal Generator that stands alone by virtue of its ease-of-use, its flexibility, and the fact it includes the generation of complete auctions and play-of-the-hand. Visual Deal uses Bridge Buff bidding and playing modules. You can watch deals one-by-one, or run a series of deals (10 to 1000) and accumulate statistics, or print a series of deals to a printer or file. The print formats are very flexible, including all needed for dealing machines. Apart from Bridge Buff and Visual Deal, there are three other useful programs included on the CD-ROM. Bid Buddy. If you want a distraction from boring work, Bid Buddy is a fun utility that pops up on your desktopwith an exciting hand to bid (you schedule how often). Bid Sequencer. Want help writing systen notes? Bid Sequencer generated bidding sequences (you decide which, up to 44,000 of them, in an Excel spreadsheet. Convention Card Editor. which enables you to ediat your ACBL format convention card. Over 30 levels of play. Build your own convention card using over 65 conventions. Or Use one of the built-in convention cards like Standard American or Two-over one. Convention cards for beginners are also available. Adjustable opening lead systems and defensive signal methods. You may ask for hints during bidding or play. Extensive built in help with many examples. Play with up to four people in a network or over the internet. You have complete control over the generated deals using the deal profiler. Jack can analyse a position and show you what he thinks about it. The fastest double dummy solver in the world will show you how many tricks can be made with each card. Play duplicate, rubber or Chicago bridge. Create your own tournaments or play in one of the many provided. Determine the par score for any hand; Jack will tell you the optimal contracts for both sides. Tip of the day, each time Jack is started. Highest quality of play of any bridge program, commercial or otherwise. Easy-to-use graphical interface click for screen shot. Multilingual interface supporting Dutch, English, Finnish, French, German, Hungarian, Italian and Swedish. Get hints or watch GIB think. Compare your play with closed room experts: Replay 2500+ deals from international tournaments and compare your actions to those of the masters. The only computer program ever to have been a member of the ACBL or to have won master points in play against humans. ACBL and international-style convention cards. Wide range of bidding systems, including Standard American, two-over-one Game Forcing, Kaplan-Sheinwold, ACOL, and traditional Goren; and also many individual conventions. High-visibility card option for use on small or hard-to-read screens. Sophisticated artificial intelligence search algorithms use Monte Carlo techniques for card play and Borel simulations for bidding. 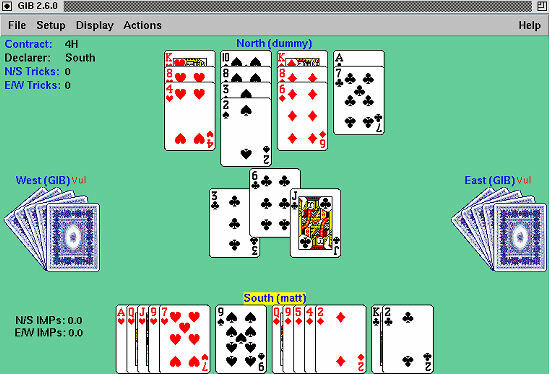 The main meat of this program is playing bridge against the computer, although there is also a multiplayer option. You can use three bidding systems with Omar Sharif Bridge - Acol, 5 Card Majors and Standard American - and hands can be set up randomly, or you can bias the deal so you're more likely to get a good hand. There is also a tutorial mode consisting of text-only comments on a selection of a hundred hands, complete with bidding and ideal play instructions, rather like the ones you get in the papers. These are quite useful in that each illustrates a salient bridge tactic. It's not really for beginners - only intermediate. Experience Bridge like never before with lavish 3D home, club and tournament environments. Sharpen your skills as you progress from the home to the club and then a major tournament! Compete against 80 opponents with many styles and varying strength. Offers Teamplay events and Pairs tournaments. Master Card champion Omar Sharif shows you how to improve your game and takes you through the bids. Chart your bridge career progression. Challenge opponents with LAN and internetplay! Adjust your game settings to such rules as Acol, Standard American, 5 Card Majors, Standard English and Modern Acol. Omar Sharif's Bridge Deluxe II is a superb update of Oxford Softworks' 1991 Omar Sharif on Bridge, also published by Interplay. Although the most obvious improvements are cosmetics - better graphics and lots of multimedia video starring Omar Sharif - Bridge Deluxe II also features much-improved software and numerous new options. The game contains a wide range of options that allow both beginners and experts alike to enjoy a game of bridge. There are over 20 playing options including conventions such as Stayman, Jacoby Transfers, Take-out Doubles and loads more. You can also choose to practice different strategies such as slam bids, and use the take-back and review options to analyze your game. In addition to full-motion video clips (including an extensive tutorial) starring Omar Sharif, the game has one of the best on-line reference materials on bridge around.You can browse an extensive guide to bidding and strategies, a how-to guide for scoring rubbers, and also a comprehensive glossary. Network game mode for several players. Support for all major bidding conventions. Screen resolutions up to 1600x1200. Many help options for beginners (including cheats). 3D Bridge Deluxe is a great way for beginners to learn the game with its own tutorials that will give you enough of the basics to play online with real people and get rankings on the GameSmith Game Server. Many Bidding Styles: Weak 2 Bids, Weak Jump Overcalls, Takeout Doubles, Cuebids for Slam Bidding, Blackwood Convention, Gerber Convention, Stayman Convention, Jacoby Transfers. Voice recognition 3D animated, interchangeable, talking opponents Card game engine is enthusiastically recognized as the best in the world by the Macintosh community. Hoyle Bridge Club is a friendly, funny new take on the classic card game. Choose from 11 unique characters, from zany goofballs to stiff businessmen - even a pirate and a puppy. All characters have their own voice-acting and playing styles, to make each game different. Along with standard bidding conventions, it also has game saves, reloads and hand replays. Also features a variety of backgrounds, card backs, and Sound sets to make the experience more colorful. Includes a built in tutorial that offers a comprehensive Bridge lesson from beginner to intermediate club player levels. Victorymul Bridge Butler is the perfect program for beginning players who want to practice basic bridge skills. Bridge Butler plays "Standard American 5-card Majors" including the Stayman, Blackwood and Gerber bidding conventions. With the help of 7 optional bidding conventions (Weak 2 bids, Weak Jump Overcalls, Negative Doubles, Jacoby Transfers, Unusual Notrump, Limit Major Raises, Michaels Cue-bids) and a variable 1NT range, you can also practice the "Standard American Yellow Card" (SAYC). The hint and replay features are great and the bidding, such an important part of Bridge, is made more understandable by the ability to replay which allows for a very good learning experience. If you enjoy playing rubber bridge you can play rubber after rubber, keep a running account of score, which lets you know how well you are progressing against the computer. Built-in tutorial to teach Bridge to beginners. Gives tips to inexperienced amd improving players. Various game options allow you to play Rubber Bridge, Chicago Scoring or Duplicate. Choose from 12 bidding systems and play four or five card majors. The easiest menu-based interface of any card game software! Enjoy live card game action and simultaneous chat via network, modem, internet, or play for free on the Microsoft MSN Gaming Zone. Many Bidding Styles: Weak 2 Bid, Weak Jump Overcalls, Takeout Doubles, Cuebids for Slam Bidding, Blackwood Convention, Gerber Convention, Stayman Convention and Jacoby Transfers. Interchangeable, 3-D animated, talking opponents. A great way to practice before an upcoming tournament. Play contract or duplicate bridge. Bidding is Standard American five-card majors with Stayman, Blackwood and Gerber conventions. Choose weak or strong 2-bids. Modify your partner's and opponents' bidding styles. GOTO Bridge is an educational software package is backed by one of France's emerging stars, Jérôme Rombaut. It is designed as an educational program, and offers a wide range of features that are sure to be of use to any aspiring player. Once you have completed the simple installation you are invited to play 20 deals so that your skill level can be analysed. You are able to compare your results against those achieved by other players under tournament conditions. (The Editor is prepared to reveal that they are testing - and that with a degree of luck he managed to score 68%, putting him at the top of the ranking list.) There are a host of features that enable you to practise specific areas in both bidding and play and you can also test yourself against the best by trying the deals from the 2009 World Championships. The graphics are outstanding and there is a detailed booklet explaining how to make the most of the various features.' - Mark Horton, BRIDGE magazine. Practice: quizzes, rubber deals, pre-scored tournaments, bidding sequences, etc. Eddie Kantar is one of the world's most famous players, and Eddie Kantar's Bridge Companion is one of the few bridge games that focus on teaching the basic rule. The game incorporates three popular bidding systems, Goren, 4-card majors, and 5-card majors. The highlight of the game is the many excellent card-playing tutorials that teach you the basics as you play the game. Ed Kantar doesn't offer any lessons on advanced bidding. If you are new to the game, Ed Kantar is a good game to start with. Intermediate and advanced players should look for something more challenging. "Interactive Bridge" by ValuSoft brings exciting Bridge action to your desktop, with the software having all of the features of the real game. Play with the computer or with a friend. Includes 13 bidding conventions, and an interactive tutorial! Micro Bridge is adjustable to any of the ten skill levels. There are many conventions and gadgets available so you can design your own system. You can select random deals or choose from a tremendous variety of deal types which is very handy for biddding practice. Beginning bridge players will appreciate the friendly and clear teaching style of the "Learn and Practice Bidding Conventions vol 1, vol 2 & vol 3 " CD-ROMs. All bridge players will love the opportunity to practice conventions and continuations in detail. Practice conventional bids, responses, and rebids on thousands of deals with feedback tailored to reinforce conventional understandings and correct bidding mistakes. Either learn a convention from scratch or practice using a convention you already know. You can learn and practice many bidding conventions with detailed explanations and interactive quizzes. These two CD-ROMs each cover three books from the 'Practice Your Bidding' series of books by Barbara Seagram. "Practice Your Notrump Bidding (CD-ROM)" covers Stayman Auctions, Jacoby Transfers and Four Suit Transfers. "Practice Your Slam Bidding (CD-ROM)" covers Jacoby 2NT, Splinter Bids and Roman Keycard Blackwood. "Marty SEZ... Bergen's Bevy of Bridge Secrets" is the interactive CD-ROM of Marty Bergen's book with software by Fred Gitelman. Marty Bergen is a 10-time North American Champion and one of the leading bridge writers and teachers in the world today. An interactive software product based on the best-selling book "Points Smoints" by Marty Bergen. This CD-ROM has plenty of example hands and quizzes and a wealth of useful advice that will have a major impact on your results at the bridge table." This interactive edition of Eddie Kantar's book is an educational and fun software product that presents the same material in interactive mode (including opening leads, signaling, second and third hand play and discarding), giving you a chance to try the questions, practice hands and tests. The animated diagrams make following the play a snap. This interactive CD-ROM presents the same material as the book in interactive mode. Advanced defensive play has never been explained more clearly. Topics such as defensive strategy, inferences, counting techniques, how to develop extra trump tricks, false carding and lead directing doubles are explained so thoroughly that even experts will benefit from studying them. This interactive edition is an educational and fun software product that presents the same material as the book in interactive mode, including entry mangagment, long suit establishment, finessing, the dreaded counting and how to plan a strip and end play. Test yourself with the numerous quizzes that follow. 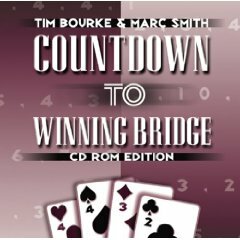 "Countdown to Winning bridge CD-ROM by Tim Bourke and Marc Smith is based on the authors' book of the same title. This interactive software program teaches the essential skills involved in counting bridge hands. "Discover Bridge, Play with Eddie Kantar" an exciting new (2010) CD-ROM from one of the world's foremost bridge teachers. Pat Harrington teaches you how to play bridge. You will learn to play bridge from scratch. No prior knowledge is required. This disk takes the best material written by one of the world's best teachers and computerizes it using the interactive and easy-to-use Bridge Baron Teacher interface, so that you can learn on your own time, with no pressure, in the privacy of your home, and at your own pace. Makes a great companion for students taking a bridge course with an bridge teacher, but is also detailed enough to stand alone. "Bridge Coach – SAYC" is designed for players looking to practice their Standard American Yellow Card bidding and improve their bridge game in a safe environment that allows you to proceed at your own pace. The disk contains 250 complete deals; the earlier deals are simpler hands where you learn basic concepts and maximum guideance is provided while playing the deals. As you advance further into the program you will encounter more sophisticated bidding and also be given more freedom in the play of the hand. Learn Bridge CD is the first complete interactive teaching program on CD. It uses video and animation to present 40 interactive lessons on basics, bidding, defense and play. It contains material from the world's best bridge teachers in easy-to-use interactive lessons. Lessons 1-6 start with the absolute basics, introducing trick taking, trump suits, and bidding; then going onto the play of the hand and bidding. There is an unlimited number of quizzes, so you can practice as much as you like. It is based on Standard American bidding, with 5-card majors and 15-17 no trump openings. Learn Bridge teaches Stayman, Blackwood, Strong 2 Club Opening, and Weak Two Bids. It is recommended for absolute beginners to intermediates. Easy to install and operate. Now you can play bridge anywhere to stay card-sharp or learn how to play with Excalibur's LCD Bridge. Excalibur Resseach Labs teamed up with international champions and officials to bring you the latest in Bridge technology. This new handheld uses 500 hands carefully researched and compiled by a panel of Life Masters and Grandmasters. Each hand is accompanied by a short commentary that explains strategies, vocabulary and other winning tips. Choose from two levels of difficulty, novice and intermediate. Uses contract bridge scoring and official SAYC bidding. 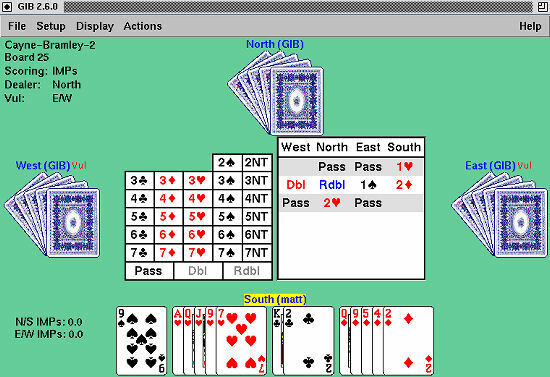 The Pro Bridge 311 is the world's strongest hand-held bridge computer and has extensive featureswith different screen selections allows all the cards to be viewed simultaneously. Users can select from the following bidding conventions; American Standard, ACOL, French Standard, and the French Strong Two. Pro Bridge plays and keeps the score in either Rubber Bridge, or Duplicate Bridge. There is a choice of random shuffle (which simulates a normal deck of cards being shuffled), manually choosing the cards you would like dealt, or choose from nearly 1 million hands in the computers permanent deal library. The computer can suggest hints if you like, and has a take back function if you want to try rebidding a hand, or replaying different cards. Pocket-sized (4.5" x 8") bridge computer allows you to play anywhere, anytime. Strong program that plays the following bidding systems: American Standard, ACOL, the French Standard, and the French Strong Two. Ideal for players of all skill levels. 11 Levels of Play - 9 Levels of Rubber Bridge, 1 Duplicate Bridge Level, and 1 Computer Peeks Level. Automatically shuffles and deals, scores, and follows suit. Hint key will give suggestions. "Bridge and Backgammon" is a combined CD-ROM with both games. The bridge can be played against the computer or you can hook up to the internet to play online. The computer bidding standard is really good and you can select which bidding conventions and preferences you want. Also, if you don't know why a bid was made, you can click on that bid and the computer will interpret it for you. You can select to play open hands or choose the cards for each hand so you can set up certain hands and study them. It's great! The backgammon is fun too, for the beginner who wants to become good at backgammon, this software is highly enough. With serious, persistant effort one can become a fine player in record time using this CD. It trains your mind without your even seeing it work. Visit Bridge Books website for a list of bridge books categorised by content and level.